Back to school shopping can be very expensive. It is that time of the year again for back to school shopping! We all know this can be a very expensive venture, so here are a few ways to help save money when hitting the stores. First before you get in the car, take an inventory of what you already have. As parents we tend to be short on time and have a tendency to just go buy everything new. You will find that it pays off in the long run to take an hour or so to sort through items you already have. For example, wash the backpack from last year and try adding fun patches to make it feel like new. Also sort through clothes to make a shorter list of what you will need to buy. Finally, we all have left over supplies from last year that are brand new, so you can check those off the list. By reusing items your kids already have, you are teaching them to become less wasteful. Next set a budget and stick to it. We all know taking kids shopping means extra spending. If you set a budget with your children and let them see the numbers add up, they will be less likely to bug you for more items. Allowing your kids to be involved in the money side of shopping will help them learn that there is an end to the amount you can spend on things. Along with a budget, make a list of the items that are needed. Making a list will help you stay on track for what your kids need for the year and not what they want. Have your kids keep track of the items by checking them off as you put them in the cart. This will get them involved with the task at hand and not get distracted. Another good way to save money is to find out if your state does a back to school tax free weekend. You can do all of your shopping that weekend and receive close to 10% off your total. Every penny helps! Many websites also offer free shipping on back to school items, as well as coupons. It would be a good idea to take a few minutes and find the deals in your area. Last of all, connect with friends to see if you can help each other out with needs. Kids do not need to have everything brand new for the school year. You may have clothing that your child has out grown or items they can’t use this year. By simply swapping these items with friends, everyone can saving money. This will also teach your children to help out when there is a need and reuse items. After all the shopping is done, take some of the money you saved and buy a treat for everyone. 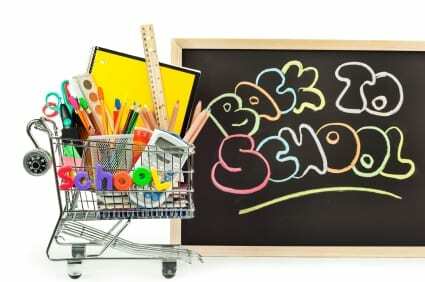 Happy shopping and here’s to another fun school year! !